← Is Los Angeles at higher risk for tsunamis? On 25 October 2010 at 14:42 GMT, an estimated magnitude 7.5 earthquake stuck off central West Sumatra. The earthquake produced near vertical motion, and source details and characteristics can be found at www.usgs.gov. Both the Pacific Tsunami Warning Center and the Alaskan Tsunami Warning Center generated warning messages. The first PTWC message came about 7 minutes post event, a time interval indicating considerable progress over earlier messages. The PTWC cancelled the warning about 2 hours later, the message is attached here. The earthquake consisted of primarily vertical motion and produced what the PTWC referred to as a “significant” tsunami. PMEL calculated the far field evolution of the tsunami as shown in the figure (very preliminary), minutes after the event. 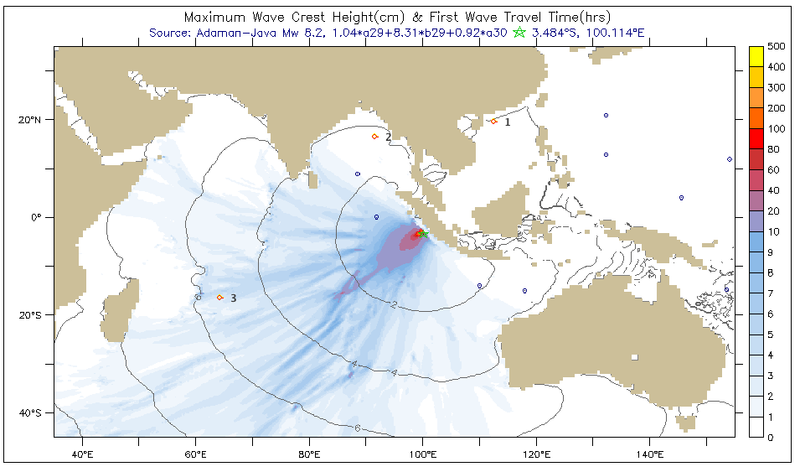 Press reports – see http://www.surf2surf.com/page.php?id=667 – raise the question whether the tsunami was larger than calculated from seismic inversion alone. (The latter is the process through which available worldwide seismic recordings of the specific event are used to estimate the type of dislocation, depth of initiation of the rupture, geometry and size, and then calculate the initial tsunami). Tens have reportedly been drowned or swept away, in stark contrast to the 2005 event, which was greater. Records from the two working tsunameters operated by Australia suggest that the tsunami was larger than estimates from seismic inversions. The tide gauge in Padang registered 1m peak to trough amplitude. The tide gauge record at Cocos Island shows a wave height about 1/5 of that of the 2004 Indonesian tsunami and 1/2 that of the 2005 Sumatran tsunami. Based solely from comparison of the size of these events, one would had expected a tsunami of about 1/2 the size recorded in Cocos. However, harbor resonance and very local amplification may have affected the tide gage measurements, but the casualty reports seem to confirm a deadly tsunami. Could this be another elusive slow earthquake ? We hope that there are only tens of tsunami fatalities as initially “reported” and that Padang and Bengkulu will consider this event as one more warning for the real BIG one – see the 2006 PNAS paper by Borrero et al below. Costas Synolakis, 26 October 12:00 GMT. WATCH ISSUED BY THIS CENTER IS NOW CANCELLED.